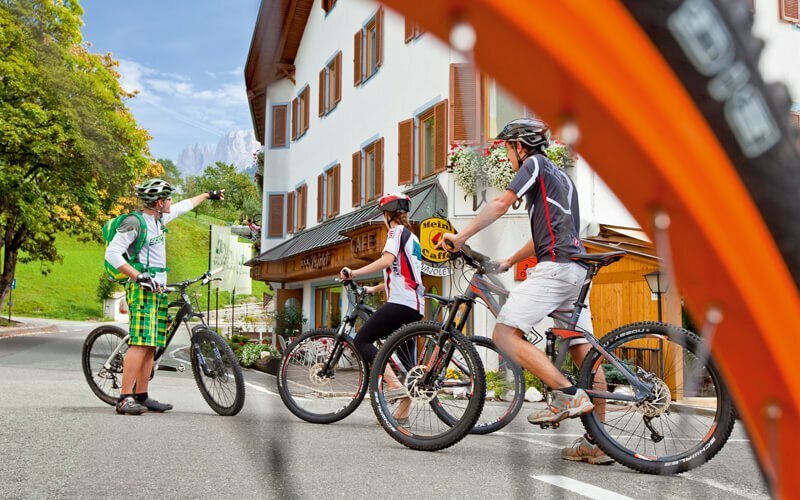 The Hotel Vajolet offers numerous offers for enthusiastic cyclists. 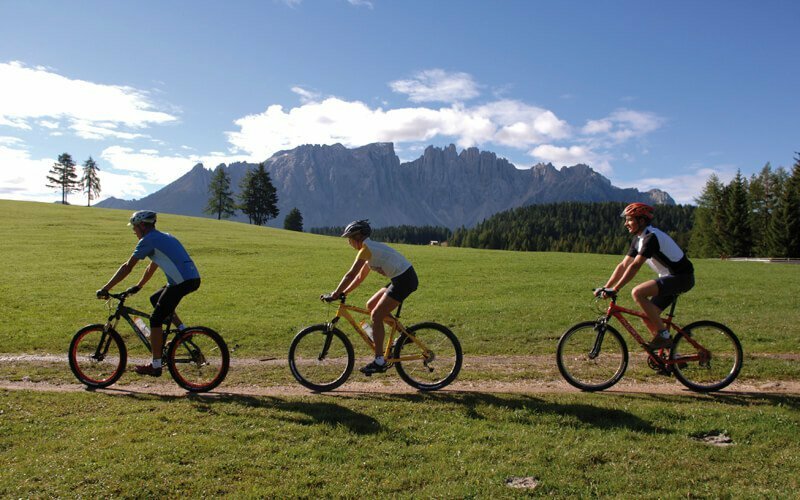 Thus, exciting cycling tours accompanied by our bike guides are offered at the foot of the Rosengarten, in the wonderful mountain landscape of the Dolomites. 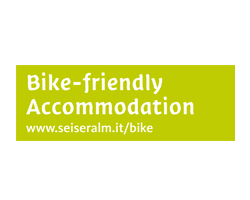 We provide you with high quality and new bicycles for rent in your bike holiday in South Tyrol. From the bike stand to GPS equipment with upload service to the washing service, everything is provided. There is also a washing area with tool kit and a lockable bike room in our bike hotel in the Dolomites. 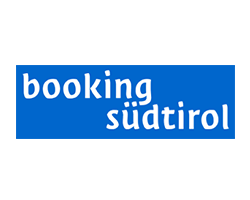 In our information corner you will find trade journals, info folders, tour maps, price lists and info tables for tours and the current weather, so that you can plan your bike holiday in South Tyrol according to your taste. We also organize regularly information evenings. On request, we offer guided tours with one of our experienced bike guides. 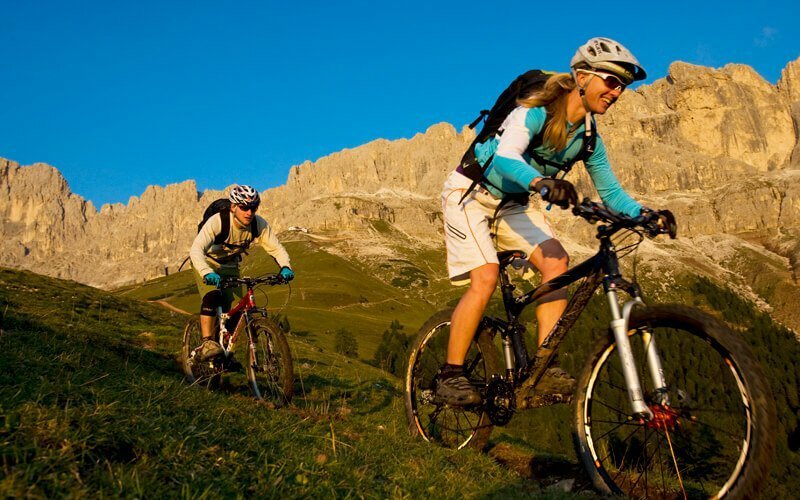 The Hotel Vajolet places special emphasis on the well-being of cyclists. That’s why we take care not only of everything around your bike, but also of your physical well-being. We have designed our balanced and regional nutritional offer especially for conscious holidaymakers. So you can enjoy fresh products from South Tyrol at breakfast and strengthen yourself for upcoming tours. We are also pleased to offer you energy bars, sports drinks and a tour catering service on the road. 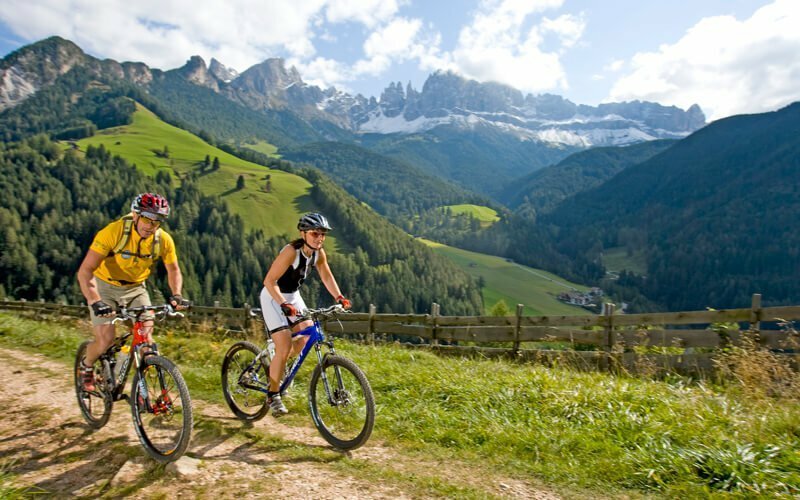 In the bike holiday in the Dolomites, you cannot only make varied trips, but also benefit from the knowledge and experience of our bike guides. 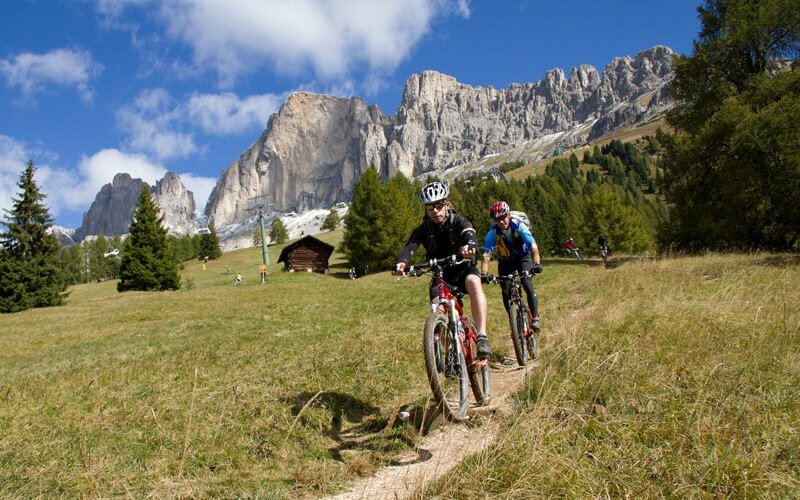 You can also take part into guided mountain bike tours, during which our bike guides will reveal pure secret tips. 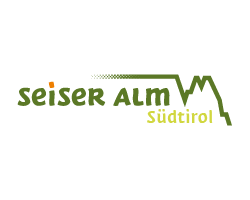 Possible tours are, for example, the Tschamin valley tour, the Carezza Lake tour, the Völs Lake tour or a tour of the Seiser Alm. Directly from Hotel Vajolet, the light and short warm-up round leads you along 2 km on the main road to the chapel in St. Zyprian, before which you turn left and drive to the roundabout to Weißlahnbad. Continue on route no. 6 to the small mountain lake Wuhnleger. After impressive views of the Rosengarten and its reflection in the water, you continue to Völsegg (path no. 4) alternating wood paths and single trails. On this itinerary you can make a small detour to the left to the St. Sebastian chapel, which is absolutely worth to see. From Völsegg a paved road leads back down into the village. The tour starts in Tiers and continues along the main road to St. Zyprian. In front of the Gasthof Rosengarten, turn right into the forest and go a little bit up the stream until you cross it and from there you go on a large forest path no. 1a up to the Niger Pass (the last piece is very steep). Relatively flat, we continue passing by the Hagner Alm and the Schillerhof, to the Wolfsgrubenjoch. From here you can go back to the Tiers brook by a way of a challenging single trail with numerous spikes. From there, take a paved road uphill to the main road, turn left and return to the Hotel Vajolet (path no. 4). On this itinerary you can make a small detour on the left to the St. Sebastian Chapel, which is absolutely worth seeing. From Völsegg a paved road leads back down into the village. From Hotel Vajolet, turn right, along the main road until you reach the first bus stop above Hotel Zyprianerhof. Go one more turn and then left until you get to the barrier. On the forest trail no. 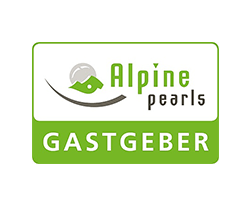 13 you go uphill, cross beautiful alpine pastures and enjoy a great view of the Rosengarten. After approximately 2.5 km on this forest road there is a branch; it is recommended to go up here to the right, because you return on the other way on the way back and this is much more challenging. There is a sweeping forest road up to an altitude of 1700m. Here we continue downhill, across the Tschamin brook, to the so-called Rechter Leger. You stand now directly on the mountain walls and enjoy a breathtaking view. Now, there is a spectacular descent along route no. 13 back to the aforementioned branch-point. Continue the same way as before until path no. 12 branches off to the right. Follow this road along the Traunwiesen to the Tschaminschwaige. Continue on path no. 6 uphill to the Wuhnleger, a small mountain lake, and overpass no. 4 downhill via Schotterstraße and single trails to Völsegg. The paved road leads you back to the village and the tour is over. The tour starts in Tiers and continues along the main road to St. Zyprian. In front of the Gasthof Rosengarten, take a right turn into the forest and go a little bit up the stream until you cross it and from there you go on a wide forest path no. 1a up to the Niger Pass (the last piece is very steep). 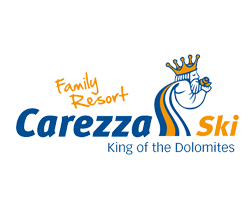 The tour takes us directly under the Rosengarten (Teerraße) direction Karerpass and then, turning right, downhill to the legendary Carezza Lake (Karersee). Continue 200m along the Teerstraße and turn right, in the direction of Stadlalm (path no. 8). At the next junction turn left (path no. 2) and then left again, in direction of Welschnofen (route no. 27). Here starts a heavy downhill, please drive slowly and pay attention to the hikers! Turn right, then up along Teerstraße to Welschnofen, turn left in the direction of Gummer, after the Pension Erna turn right, uphill direction Obergummer »Samerweg«, 2 A mark. Turn left, 2 A mark, single trail with short sliding passages, right sign »Zipperle«, then follow the 2 A mark. Right over the bridge, then up steeply on the right. After the Zipperlehof on the Teerstraße continue to the Gasthaus Lärchenwald. From the inn go to the left, following the no. 1 signpost to the Wolfsgrubenjoch. From here you can go back to the Tiers brook along a way of very demanding single trail. From there, take a paved road uphill to the main road, turn left and return to the Hotel Vajolet. Alternatively, you can continue on the Wolfsgrubenjoch up to the Niger Pass and from there you can go back the same way as at the beginning. The first 200 meters after Gasthof Lärchenwald in Gummer are quite steep, then follows a moderately ascending and descending section till reaching the Niger Pass. From the Hotel Vajolet turn left over the main road and before the Despar Market Pircher to the right, high above the paved road to Völsegg. From there the tour takes you on a narrow forest road to Schönblick. Now it is challenging and you drive on path No. 7 along the Hammerwand and then a bit on the Prüflweg No. 1 to the Tuffalm, a great stopover. We continue along path No. 1B to the Völs Lake, a beautiful bathing lake with a fantastic view of the Schlern. Continue in the ascending direction Tschafon on the road no. 2 via Obervöls, as well as on route no. 8, the Umser round path and on the ways no. 3, 4, 10, 10A and 7 back to Schönblick. The return from there to Tiers is the same as that at the beginning. From the Hotel Vajolet turn left over the main road and before the Despar Market Pircher to the right, high above the paved road to Völsegg. From there the tour takes you on a narrow forest road to Schönblick. Now it is challenging and you drive on path No. 7 along the Hammerwand and then a bit on the Prüflweg No. 1 to the Tuffalm, a great stopover. We continue along path No. 1B to the Völs Lake, a beautiful bathing lake with a fantastic view of the Schlern. Via the lake path it is relatively flat to Salegg and from there to the valley station of the Seiser Alm cable car. 800 m higher to Kompatch. From here it goes downhill, alternating over forest trails and road, back to Salegg and over the lake path again to the Völs Lake. Via Obervöls (path no. 2), relatively flat to the traffic circle and then towards Tschafon with a little ascent to Schönblick. Via Völsegg you drive back to Tiers to the Hotel Vajolet.